Japan has already launched a new visa system to invite more foreign workers to combat the labor shortage in the country. This is a good opportunity for Filipinos who want to work in Japan because, under the new visa system, foreign workers with certain Japanese language and job skills can now apply for resident status and can work in 14 sectors such as construction, farming, nursing care among others. It allows holders to bring in family members and has no limit on the number of times they can renew their visa and Japan is expecting up to 345,150 foreign workers over the next five years! So what are you waiting for? 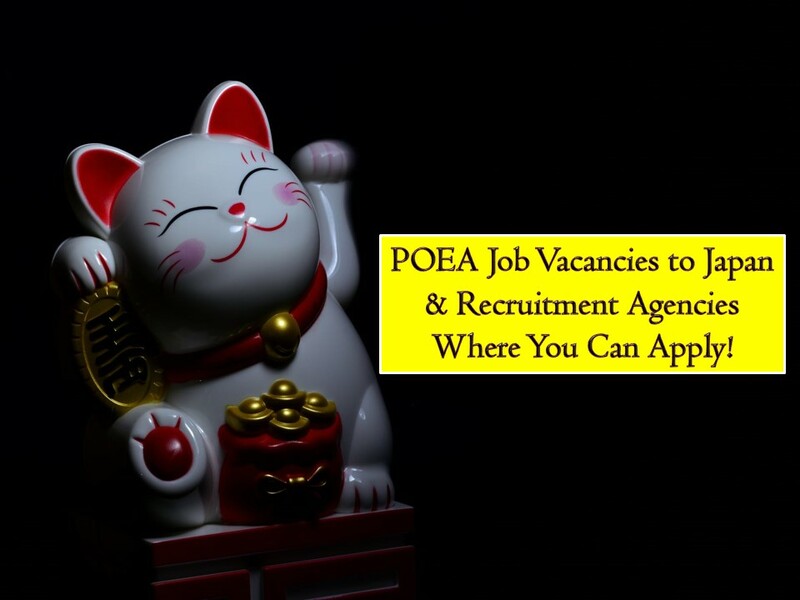 Check for the following job orders from the Philippine Overseas Employment Administration (POEA) that will match your qualification and apply for a job! This article is filed under Japan jobs, jobs abroad, IT jobs, Filipina Maids, Filipino workers, Hiring Filipino workers, job site and employment opportunities.